A US jury has convicted a former Ku Klux Klan member of manslaughter over the notorious killing of three civil rights workers in 1964. The jury in Mississippi rejected murder charges against Edgar Ray Killen, now aged 80, but found him guilty of recruiting a mob to kill the three. Killen now faces up to 20 years in jail for the role he played 41 years ago. Campaigners hailed the verdict, but said more should be done to deal with Mississippi's racist past. 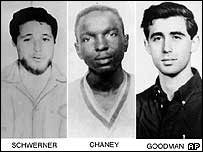 The defendant had denied taking any part in the killings of Michael Schwerner, 24, Andy Goodman, 20, and James Chaney, 21. Killen - who is a Baptist preacher - showed no emotion as the verdict was read in the courtroom in the town of Philadelphia. 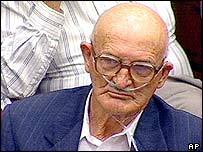 A frail man, he used a wheelchair in court and was connected to breathing apparatus during the trial. Both sides expressed some disappointment with the manslaughter verdict: prosecutors said they would appeal because the charges were changed late in the trial while campaigners argued that a manslaughter verdict avoided some awkward questions. Earlier on Tuesday, prosecutors made an impassioned plea for his conviction, saying the victims' families had waited for decades for justice. "Is a Neshoba County jury going to tell the rest of the world that we are not going to let Edgar Ray Killen get away with murder any more?" asked prosecutor Mark Duncan. "Not one day more." The activists were two white men from New York and a local black colleague, who were killed while campaigning for the registration of black voters. They were arrested for a dubious traffic violation, and attacked by a gang of Klansmen and police after being released in the middle of the night. They were abducted as they drove out of the Mississippi town and shot dead. Their bodies, riddled with bullets and badly beaten, were buried at a dam and only found 44 days later after an extensive search. Mr Killen, who was a suspect in the original investigation but never convicted, was re-arrested after new evidence emerged.